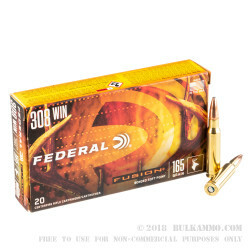 The unique attributes of the Federal Fusion line of performance rifle ammunition come into play specifically for deer hunting. 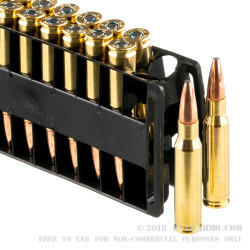 These .308 Winchester rounds are excellent pieces of the puzzle that help to ensure a successful hunt. The electrochemically bonded jacket means uniformity and weight retention are a prime factor in the process. The jacket is built perfectly around the bullet core. It ensures bonding of the highest level and makes the expansion very uniform upon impact. The soft point ensures that mushrooming expansion starts out properly. The 165 grain weight projectile is a boat tail for accuracy’s sake and that bullet weight ensures that the proper amount of velocity and energy are delivered at the target. 2700 feet per second of muzzle velocity means that the trajectory is flat. 2670 muzzle energy and a low degradation of both of these ballistic numbers means that when you hit your target a fraction of a second after you fire, you’re dropping it right where it stands. A proper component selection and a very consistent level of powder and a good clean powder choice make the Boxer primed brass almost seem like an afterthought. Who’s thinking about handloading or reloading when the factory ammunition is putting out numbers like these and results like that? 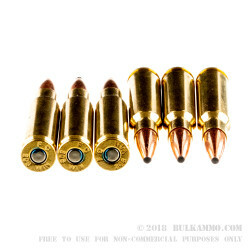 Q: Which is the best elk round? 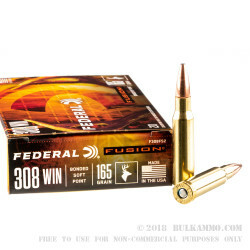 A: There are many excellent choices for hunting elk in the .308 caliber, and this Federal Fusion is one of the best. It's a bonded bullet design that retains a lot of weight, even in a tough animal like an elk.